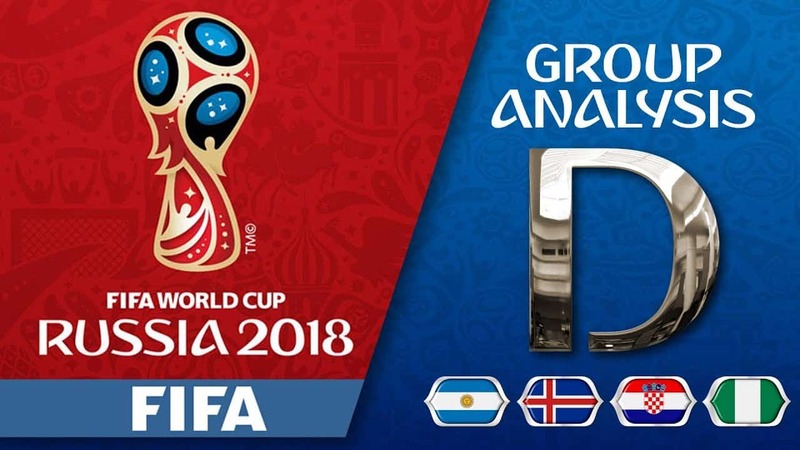 World in Sport progresses through our 2018 FIFA World Cup group previews, as we highlight group D.
With favored Argentina carrying a top-five FIFA ranking, the odds are in their favor to advance to the knockout round in 2018. La Albiceleste made it all the way to the finals in Brazil at the previous edition of the World Cup in 2014. A loss to Germany led to quite an uproar in South America, Maradona himself adding to, if not creating, some of the controversy that followed. Croatia is expected to give Argentina a run for their money in group D play. The two teams are expected to move on to the knockout round of the Major tournament, while Iceland and Nigeria are hopeful to pull off an upset or two in Russia, while creating their own historic story to tell. Let’s reveal the four teams that will be competing in group D, as well as the schedule. Argentina finished as runners-up in last year’s edition of the World Cup, as they have on two other occasions. They lost to Uruguay in the finals at the first World Cup in 1930, and again at the 1990 Cup in Italy to West Germany. Fortunately in 1978 and 1986, Argentina hoisted the trophy which, to date, makes them one of five teams to have more than one World Cup title. Croatia is the secondary favorite in group D to Argentina, and is making their sixth appearance at the World Cup this year. Croatia was, of course, one of a handful of tiny nations that were formed after the break up of Yugoslavia in the early 1990’s. We will touch on that again when we review Serbia in group E, who were also part of that break up. Iceland is one of two nations making their debut this year at the 2018 World Cup, Panama being the other. Iceland broke on to the International scene in 2016, when they advanced to the quarterfinals of the European Championships. Nigeria has been to five of the last six World Cups, making their sixth appearance overall this year. The Super Eagles are looking to build on a round of 16 appearance at the last World Cup in Brazil. The team has advanced to the round of 16 in three of their five appearances thus far. For the team roster and other highlights, check the Argentina team page. After Argentina indeed finished with another World Cup disappointment in Brazil (If you can call a finals appearance a disappointment), Maradona chimed in so hard that Lionel Messi quit playing for the Argentina National Team. I wish I could go off on a rant that is 4,000 words long about all of that. Diego Maradona needs to shut his face, and I will leave it that! The dude wins one World Cup and had the audacity to call Lionel Messi, “Not good enough”, “Messi is no legend”, Blah blah and more blah! After clearly stating that the pressure was not worth the abuse, Messi had enough of Maradona’s antics. Messi was thought to have hung up his International boots until the fifth match of South American W.C qualifying saw his return. Luckily for all of us, Messi is bigger and classier than Diego Maradona will EVER BE! Period! Whether you are a fan of Argentina or just a fan of football, take time to appreciate what he does. Also as a football fan, the forwards that manager Jorge Sampaoli took with him to Russia are outstanding. All of them carry a heavy résumé full of success at club level, so the only thing left to do is win a Major trophy. Sergio Aguero, Gonzalo Higuian and Paulo Dybala join Messi up front, and where do you even start? Talent much? Higuaín recently set the Italian Serie A scoring record, while he and Dybala continue to win Scudettos with Juventus. Sergio just helped Manchester City manhandle the English Premier League this past campaign. Obviously, Messi and Barcelona destroyed the Spanish Premier League (La Liga) this year as well, so all four of these animals kissed trophies this year. It is hard to believe that it has been since 1993 that Argentina has won a Major trophy. Will it come in 2018? As well recognized as the front line is for Argentina, there are concerns in net and on the back line. Goalkeeper Willy Caballero is seemingly the guy we will see as the final line of defense for Argentina. That is a huge concern, being that he is simply not even close to a #1 net minder. Sergio Romero was in line for the job, but his knee injury surely came at the wrong time. A supporting midfield does have experience, however, with the likes of Angel Di Maria and Javier Mascherano. The two have combined to earn 235 caps on the Argentinian back line. Can either of these three teams challenge Argentina for the group supremacy? Let’s see which of them battles hard enough to at least join Argentina in the knockout round. For the team roster and other highlights, check the Croatia team page. Croatia manager Zlatko Dalić signed on this past October to man the sidelines for The Blazers. As a result of clinching a bid to Russia through UEFA qualifying, he is now under contract through 2020. So far, so good, as he has a 3 – 1 – 1 record in five matches, and is about to embark on a huge journey! Croatia’s first appearance as a nation at the World Cup came in 1998, and it was quite a result. A semifinals showing and a third place finish, showed signs that Croatia wanted to be a factor, not only in Europe, but Internationally as well. Croatia was certainly impressive in UEFA qualifying, as they have always been for the most part. Qualifying has never been the issue with Croatia, because it’s largely about what they ‘didn’t’ do with it when they got there. Croatia was one of the four second place teams from UEFA qualifying that had to advance through the second round. With a 4 – 1 two-legged aggregate win over Greece, Croatia was awarded a bid to the 2018 World Cup. There are many recognizable names on this roster, as Croatia has players spread all around Europe. Mario Mandžukić is also a part of that Juventus squad I mentioned that features Dybala and Higuaín from Argentina. There are a handful of players in the world who are known for getting up and using their air-assault to finish attacks. Super Mario is one of those men, and he has two other Serie A members along side him in Russia. Inter Milan’s Ivan Perišić put up 11 goals in Serie A this past campaign, and Nikola Kalinić added six for AC Milan. Andrej Kramarić, Marko Pjaca, and Ante Rebić complete the front line that Coach Dalić brought to Russia. The three all play in German Bundesliga, but one of them really just had a huge moment recently. Ante Rebić scored two goals in Frankfurt’s 3 – 1 monster upset of Bayern Munich in the German Cup final on May 19. Hence, probably affecting the coach enough to ask him to “come join us” in Russia. Bayern was tagged for a domestic double entering the DFB Pokal final, but Frankfurt wasn’t listening to that. Ironically, the Frankfurt coach was already set to be leaving to manage AT Bayern Munchen, and that gives us a segway. Croatian Niko Kovač signed with Bayern before the final took place, in fact. Kovač earned 83 caps with the Croatian National Team from 1996 – 2008. Are you waiting for us to mention the other three players who will play a large role for Croatia? Goalkeeper Danijel Subašić is just about as good as it gets in net. He’s been leading A.S Monaco of Ligue 1 since he arrived there in 2012. We already mentioned only allowing four goals in the entirety of UEFA group stage, so that should tell you plenty. Two Croatian midfielders have 194 combined caps, and they both play in Spain on big stages every weekend. Captain Luka Modrić has 104 caps under his boots, and he still has a trophy to chase with Real Madrid. The Champions League final between Real and Liverpool airs on May 26, and Modrić will certainly be there for that too. Over at Barcelona, Ivan Rakitić gets to hang around Messi, Suarez and company every day. We all know there will be some surprises in this year’s World Cup, but will any come out of group D? For the team roster and other highlights, check the Iceland team page. Gylfi Sigurðsson wears the #10 jersey, and he leads Iceland’s World Cup roster with 18 goals from his 55 caps. Sigurðsson signed a sweet £40 million deal with Everton of the English Premier League this past October. Ironically, eight days after signing, he scored his first goal for Everton against a club from Croatia, Hajduk Split. Captain Aron Gunnarsson has worn the arm-band since 2012, and the team has been better for it ever since. Remember now, this Iceland team was inches away from going to the 2014 World Cup in Brazil. Revenge may be on the minds of Strákarnir okkar, because Croatia was what kept them from their first ever World Cup bid. Croatia and Iceland met in a two-legged playoff that gave automatic entry to the winner. The two played to a scoreless first-leg draw, and Croatia came away with a 2 – 0 win in the return leg. Iceland didn’t have to wait too long to erase those memories, however. An appearance at the 2016 European Championships was what finally earned them a bid to a Major event. What a run it was, as Iceland navigated their way to the quarterfinals of the event, including a huge 2 – 1 win over England along the way. Alfreð Finnbogason will be someone to watch out for at the World Cup this time around. He chipped in three goals during qualifying and is emerging in his third year in Germany with Augsburg. For the team roster and other highlights, check the Nigeria team page. Nigeria emerged from African(CAF) World Cup qualifying, playing in what was labeled the ‘group of death’ to advance to Russia. They are featured in a group with Cameroon, Algeria and Zambia, Algeria was the squad looking to build on their 2014 World Cup experience. Algeria advanced to the round of 16 in Brazil, taking eventual Champions Germany to extra time, before losing 2 – 1. Head Coach Gernot Rohr took over at Nigeria in August of 2016. The 64-year-old West German native has been pacing the sidelines as a manager since 1990, dating back to his days at Bordeaux. After a lengthy career as a player at Bordeaux, Rohr began his coaching career with the French outfit a year after retiring with the club. Moses Simon has burst onto the scene lately for Nigeria, showing his youth and skill in qualifying. At only 22 years old, you can catch the striker on weekends playing for Gent in Belgium. He has scored four goals with the National team, two of which came in qualifying for this year’s Cup. He’s not to be confused with Victor Moses, who also features in the Nigerian midfield. Victor has added 11 goals to his ledger with the National Team in his 32 caps with the squad. He scored three goals and led the team in qualifying in scoring. The two of them have over 50 caps combined, and both will likely play a part on the pitch this year. Coach Rohr certainly had a revolving door of forwards play for him over the last year. Nigeria had 25 forwards either get called up, or see playing time over the last 12 months. Captain John Obi Mikel brings experience to the central midfield, having hoisted the Champions League title with Chelsea. He has amassed 83 caps for Nigeria and will provide stability when things could seem like they’re getting away. Even though Argentina and Croatia are almost assured to move on to the knockout round, this group still remains interesting. As exciting as it is to even make it to the World Cup for some teams, drawing Argentina and Croatia in your group sure presents challenges. It’s that exact challenge that Iceland and Nigeria will have to accept. As powerful as Argentina’s offense looks on paper, they still seem to get lulled in to 1 – 0 results. Leaving windows open for Iceland and Nigeria could deem dangerous with the experience on the pitch. In reality, this is not a group that lacks names from all four teams Even though Iceland appears to be well out of the running, they know they will have to overachieve in Russia. There really is no expectation to set, other than getting out there and trying to prove everyone wrong. Admit it. You would love to see Nigeria and Iceland take the top two spots in group D.
Imagine that? All the hype for the two big team in the group, and then the underdogs come out to play. The middle games of the group hold the most interest, when Argentina faces Croatia, and Nigeria takes on Iceland. That will leave one remaining fixture to play, and that final day could be meaningful for all four teams. As much as we can dream, I am one who simply cannot deny what we are about to see. Unfortunately, Argentina is listed at -175 to take the top spot, and that is a little steep. They will indeed find a way to advance and win this group. Our best advice is to take the matches one-by-one, and take your action from the matches themselves.